3D printing is now out of the “fun” stage and into serious manufacturing capability. 3D printing is part of the digitization of the manufacturing process from the initial design and production to spare parts. 3D printing is making the transition from prototypes to finished goods by going beyond the limited functionality of a single item to meeting more demanding manufacturing requirements. Manufacturers need to rethink the design principles, shapes and forms that worked with subtractive manufacturing, but are entirely dissimilar to additive 3D printing. To benefit from 3D printing in production manufacturing, companies should rethink design methods and principles, and foster new standards for 3D printing as well as the skill sets to use them. Leading the implementation of 3D printing is low-volume, high-cost parts that are difficult to produce. 3D printing is best where the volume is low or where change is frequent—situations where subtractive manufacturing is least effective. Industrial 3D printers are superior to consumer grade 3D printers for manufacturing. The leading commercial 3D printers have large print capacities, top-notch resolution and use exceptionally durable materials. When selecting an industrial 3D printer, match the type of technology with your production requirements. When searching for a printer, look for features, such as resolution, size and manufacturing method. What will you be printing? Will it be prototypes or production pieces? Some printers print with durable plastic, while some can print metal parts. When looking for production 3D printers, there are many technologies to choose from, such as FDM (fused deposition modeling), MJP (multi-jet printing), PolyJet, DMLS (direct metal laser sintering) and others. You'll want a printer with a technology that can print quickly, have resolutions of at least 0.1 mm or smaller, and a large print size of about 10 x 10 x 10 inches. The best industrial 3D printers print with an assortment of methods, and the materials they utilize also vary. The most common material is a durable plastic, ABSplus. 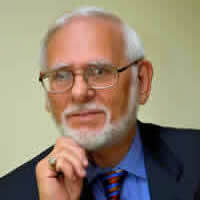 Other materials include metal, wax, resin and long lasting plastic. Let’s look at some of the top selling 3D printers. 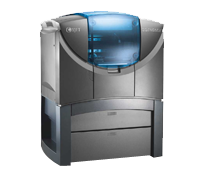 To begin, the Stratasys Dimension 1200es is your gateway into the company’s family of professional 3D printers. Easy-to-use CatalystEX software lets you choose from two print modes for greater detail or faster 3D printing. The printer prints in nine colors of real ABSplus thermoplastic. This 3D printer lets you choose fine resolution or faster printing. Model and soluble support materials come in handy enclosed cartridges that are easy to load. The plastic filament travels through a tube to the print head, where it’s heated to a semi-liquid state and extruded in thin, accurate layers. With the Dimension 1200es you get the right parts at the right time, using a wide range of conventional and additive manufacturing technologies to deliver plastic and metal parts at every phase of product development and production. The EOS Eosint M 280 uses DMLS to print metal into finished, ready-to-use 3D parts. The M 280 can handle large build volume, many compatible materials and produces high-quality, efficient prints. A high-grade laser melts metal materials, turning them into a powder, which is then extruded into layers until the part is finished. The maximum build size is 10 x 10 x 13, which is larger than average for most 3D printers with a 23 FPS scan speed, making production very efficient. Light metal alloys such as aluminum, titanium and heavier metals like steel or iron are compatible with the Eosint. This large-scale 3D printer is truly a large machine only suited to companies with dedicated space and resources. The Eosint M 280 is about 2,800 pounds and needs at least 16 x 12 x 10 feet of installation space. Next is the ExOne S-Print, which is a resin industrial 3D printer, that creates high-quality casts and molds. The S-Print doesn’t create finished parts, but creates casts for other materials including various metals like steel and iron. With the ExOne S-Print, you can generate incredibly precise molds so you can create superior production products. This is a resin machine that uses specialty sand to cast molds and cores. Since the S-Print pours resin into sand, you won't need additional support structures, eliminating the time to remove them. This professional 3D printer uses STL files from CAD software. The Objet Eden260V is a mid-size, compact PolyJet 3D printer. Although it takes up more room than your typical bookcase, the Eden260V can produce bigger (10 x 10 x 8”), more detailed prints than its competitors, as well as print in 18 colors and multiple materials such as transparent, opaque, polypropylene, and rubber materials. A 0.016 mm resolution is much more accurate than the standard 0.1 mm of many comparable printers. 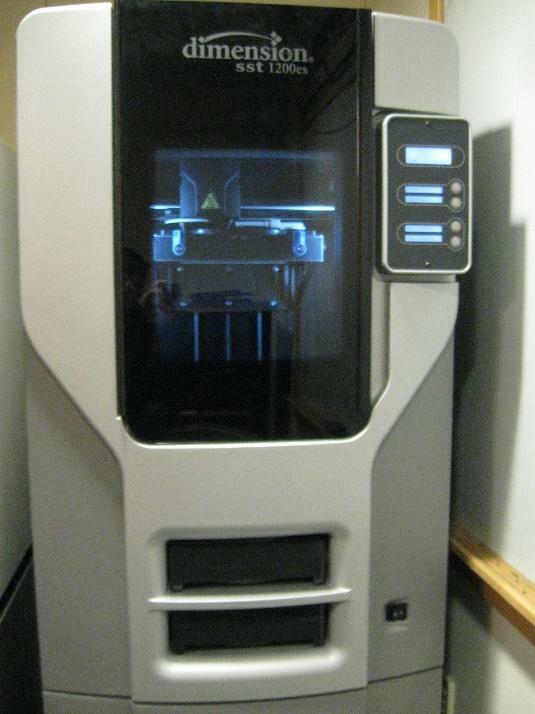 Although it might seem like a large 3D printer, the Eden260V is a mid-size model. This compact industrial 3D printer weighs a little over 900 pounds. A clear blue viewing enclosure protects the printer and the rest of it is a stylish shade of gray so it can fit in well in your office or workshop. The Solidscape Max2 is one of the best industrial 3D printers for medical research, dental, jewelry and manufacturing sectors. This wax 3D printer doesn’t print production parts, but prints a wax pattern that you can use to cast in a different material to create a part. Since this large-scale 3D printer creates molds for other materials, the casts that the Max2 creates are extremely intricate and accurate. You can customize the thickness with this machine between 0.02 and 0.05 mm, which is excellent for this type of 3D printer. With the Max2, you can print casts up to 6 x 6 x 4 inches. Since the wax material the Max2 uses is so durable, you can make detailed prints. For a professional 3D printer, the Max2 is smaller than many of its competitors. Its design is only 22 x 18 x 16 inches and it weighs 75 pounds. Some of the materials you can cast with this industrial 3D printer include metal, bronze, brass, silver and aluminum. Overall, this automatically calibrated machine is simple to use and even includes a touchscreen for easy navigation and control over the prints. 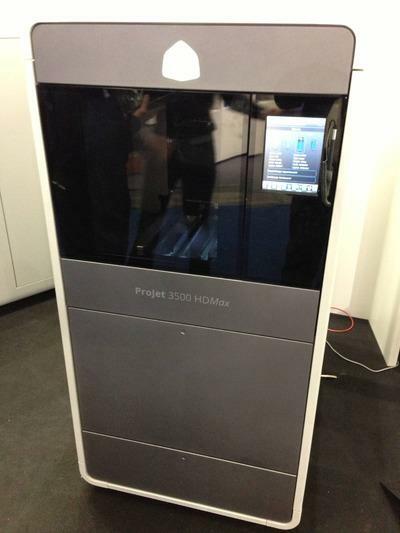 The ProJet 3500 HD Max is a multi-jet printer, the ProJet deposits layers of melted plastic to form a prototype. Specific settings for high definition and high speed are quality features of the 3D Systems' printer. The ProJet 3500 is unique in that it has four printing modes: high definition, high speed, ultra-high definition and extreme high definition. Models can be printed between 0.025 and 0.05 mm accuracy, with the maximum size that the ProJet 3500 can print is 12 x 8 x 8 inches. There are seven colors available, all of which are extremely durable. You can choose from conservative colors, such as black, crystal, navy, white and gray. Each color has a different density, strength and heat distortion temperature. The machine is 60 inches tall and weighs 711 pounds. 3D printing technology will have a significant impact on how manufacturers do business. Now, is the time to evaluate your manufacturing needs.